Additionally, detailed information for molding is available in our Molding Fiberglass article and detailed repair instruction is available in The Ultimate Fiberglass Repair Guide. There are several additional articles in our Learning Center which might be helpful to you. Gel Coat is a specially formulated two-part Polyester Resin that is intended to be the first layer of resin applied in a mold when making a polyester or vinyl ester composite part. Let’s break that statement apart to better understand gel coat and when to use it. Gel coat is a specially formulated two-part polyester resin. Gel coat is a high grade, low shrink, thixotropic (low sag) liquid polyester resin. It is intended to create an opaque surface which will completely block glass pattern show-through. There are various formulations of gel coat for specific applications such as Tooling Gel Coat and Clear Gel Coat but most gel coat is a high gloss, opaque solid color. Polyester resins in general, and specifically gel coats, are naturally UV resistant and properly cured parts can be submerged in water. Most boats are made using gel coat with polyester resin and fiberglass. Boats are easy to envision and provide a simple example which we will use throughout this article as a point of reference. Gel Coat is purchased as a liquid and cures as a result of adding MEKP hardener. Gel Coat is intended to be the first layer of resin applied in a mold. Gel coat is generally sprayed into the mold in a couple of thin passes. After the MEKP hardener is added, there is generally about 20 minutes of working time before the gel coat will begin to harden. Some fabricators like to thin the gel coat before spraying and will add pure liquid styrene (also referred to as Styrene Thinner or Monomer) to the gel coat. Gel coat should not be thinned with a solvent such as Acetone because the solvent will actually break down the molecular chains that the resin is made of and interfere with the properties of the cured gel coat. Gel coat can be tricky and even an experienced fabricator can have occasional gel coat problems. Difficulties with temperature, catalyzation levels, sprayed mil thickness and allowing proper time between gel coat applications all contribute to problems the fabricator might have when he releases the part from the mold. Gel coat is used when making a polyester or vinyl ester composite part. When a fabricator releases his part from the mold and sees a perfect, glossy gel coat surface, it is a happy moment. Since the gel coat has been backed by subsequent reinforcement and resin, it can’t be seen until it is out of the mold. Gel coat is now part of the final composite. It is not a "coating." It has cured with the part, allowing it to bond both chemically and mechanically. In a properly fabricated and cured part, the gel coat should not delaminate nor should the gel coat "chip" off from the surface because it is not a surface coating. If you are making a polyester or vinyl ester part in a mold, using gel coat is highly recommended as the proper material for the exterior surface. Fibre Glast offers several varieties and over 900 colors of gel coat. If however, you are making an epoxy part, gel coat is not recommended. The chemical bonding that allows gel coat to cure into the finished polyester part does not happen against an epoxy resin. There isn’t a common suitable alternative to gel coat when working with epoxy. ChromaGlastTM is a full line of paint and undercoating products developed by PPG for Fibre Glast to be used in a wide variety of composite applications. ChromaGlast paints and undercoatings feature a low VOC (2.1 or less) which is helpful in many geographic locations where emissions are monitored or limited. 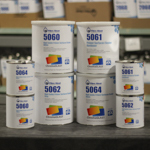 ChromaGlast Premium Single Stage Paint has over 250 colors of urethane based paint that can be used over epoxy, polyester, vinyl ester, SMC and most metal surfaces. The ChromaGlastTM undercoating line offers a variety of primer/ sealer/ surfacers which can fill and smooth glass pattern show. Once the surface has been prepared, you can mask it completely with a beautiful, glossy, opaque color. In addition to solid colors, there are several metallics to choose from which is a finish option unavailable in gel coat. As a single stage paint, it is not necessary to finish with a clear coat. Single stage does not mean single component, however. ChromaGlast single stage paints all require the addition of hardener and drying accelerator and most people are going to want to thin up to 10% with solvent. ChromaGlastTM Paints should all be sprayed and, like gel coat, there is technique involved. Spray equipment is discussed later in this article. ChromaGlast Paint is intended to be an exterior coating on a finished composite. Paint, particularly polyurethane paint, is compatible with all metal and cured substrates—including epoxy (Gel Coat is not recommended for building over epoxy finishes). ChromaGlastTM paint is an excellent solution for when your composite project needs an exterior coating to beautify or protect its exterior. 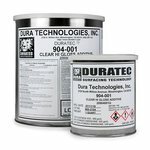 Paint can’t be sprayed in mold during the original construction of a composite, it must be applied to a finished part. Both gel coat and ChromaGlast are sensitive to extreme temperatures when applying. Recommended application temperatures for gel coat are generally identified at room temperature with consideration that a mold kept in that room is generally going to have a surface temperature similar to the room temperature. However, if your mold has been sitting outside in a blizzard and you drag it in, you can’t start spraying until it has been indoors for 48 hours. Gel coat should be sprayed at around 75°F and never below 60°F. Small adjustments to the amount of MEKP is a common practice among experienced fabricators to adjust to the ambient temperature. Additionally, gel coat is affected by mass to a much greater degree than paint. If a large bucket of gel coat is mixed, the heat created will cause the pot life of the gel coat to shorten and likely cause gel coat problems on the part. However, you can mix a large batch of paint and not have that problem. Recommended temperatures published for paint application are based on surface temperature and NOT ambient temperature. ChromaGlastTM Paints and undercoats are expected to be applied to parts with a surface temperature of 70°F. It is not recommended to apply paint below 55°F. Follow the “Rule of 15” when interpreting dry times meaning that for every 15 degrees of temperature change, your time is cut in half. This chart will help explain. The gel coats and paints carried at Fibre Glast were formulated to be sprayed. Despite this, there are differences in the equipment that should be used for each type of product. When considering spray equipment, there are a few choices: pressure fed spray guns, gravity fed spray guns, and dump guns. Each type of equipment offers benefits and has considerations for the different materials. Gravity Fed HVLP Guns — HVLP stands for High Velocity Low Pressure. This means that the gun is able to spray liquids out quickly without the need for a high pressure air source. This style of gun relies on gravity to feed liquid from a cup which is then atomized by passing air. Since the air pressure is lower, there typically isn’t as much air in the paint or gel coat to create bubble or pin holes later. This style of gun should be kept mostly vertical during your spray and it typically requires a thinner material since gravity is responsible for the liquid delivery. Pressure Fed HVLP Guns — This style of gun pressurizes the cup where the liquid is kept, forcing it through the gun and it is atomized by passing through the nozzle of the gun. Pressure fed guns offer a larger range of motion during and are a bit more forgiving on material viscosities. Dump Guns — This type of gun is mostly used for gel coat, though nozzles are available for various types of materials. Dump guns have an open nozzle that liquid can pass through, they rely upon a high volume of high pressure air to atomize the passing liquid. This type of gun allows for a high volume of material to be applied in a short period of time, and can be used with thicker materials. Gel Coat has a higher viscosity (it’s thicker) than paint and has thixotropic properties. This means that gel coat can, in proper thicknesses, cling to vertical surfaces without running down and pooling at the bottom. It is also intended to be built to a total thickness, typically 3-5 mils per coat and 20-25 mils total. Because of those properties, gel coat spray equipment is designed to apply larger quantities of thicker material. We don’t recommend that most people use their existing HVLP spray equipment for gel coat because the nozzles are typically too small for gel coat. At Fibre Glast, we offer 4 spray guns specifically for gel coat. Items #123-A and #126-A are gravity fed HVLP-style guns. 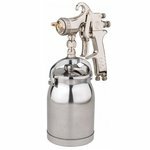 #123 ¼ Pint Touch-Up Spray Gun features a 2.0mm nozzle while #126 0.6 Liter Touch-Up Spray Gun features a 2.5mm nozzle. The #123 gun is suited for spraying gel coat across a small surface area, typically a small surface repair. The #126 gun is suitable for both small and medium areas, typically medium repairs and small parts/molds. Item #134-A is a pressure fed HVLP style gun. It features a 3.0mm nozzle and can be used for medium sized projects, typically a large repair or medium sized part or mold. Finally our #120-A Gel Coat Cup Gun is a dump gun. There are a variety of nozzle sizes available for different materials, but the primary use of this gun to quickly apply gel coat to large areas. It is most frequently used for new part and mold construction rather than repairs. Since paint is thinner than gel coat, the spray equipment for paint is geared towards its viscosity. Paint is also sprayed in much finer coats, with a total dry film build of only 1.0-1.5 mils, so the consistency of spray must be high. This means that high quality spray equipment for paint needs to have highly precise spray pattern and air controls. Spray equipment that is purchased for gel coat is typically not suitable for paint. At Fibre Glast, we offer 2 spray guns specifically for ChromaGlast products. Item #238-A is a gravity fed HVLP-style gun. It features a 1.4mm nozzle which is appropriate for ChromaGlast paint products. Since paint covers a larger area for a given volume, this gun recommended for most paint projects. The #235-A is a pressure fed HVLP style gun. It features a 1.6mm nozzle, which is suitable for both undercoats and can be used for paint. We also offer a 1.4mm Nozzle Kit which makes the #235 more suitable for spraying paint. When applying gel coat, it is common practice to use a Gel Coat Thickness Gauge (such as our #122-A) to measure the applied thickness. The gauge can be inserted into the wet gel coat and the gel coat will fill back in to cover any mark. 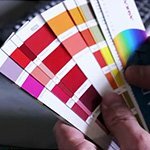 Gel coat application is defined in wet film thickness. Typically gel coats are intended to be sprayed 3-5 mils per layer, building to a total of 20-25mils wet. Unfortunately, you can’t really measure wet film in paint unless you measure in overspray because it will mark and not fill in. Paint application is recommended in Dry Film Thickness which is generally half of its wet film thickness. ChromaGlastTM paint should be sprayed in either 2 coats or one cross-coat building to a total dry film of 1.5-3 mils. Generally, if you are making parts or molds with polyester or vinyl ester resin, you will want to use Gel Coat. Your gel coat offers excellent corrosion resistance and permits immersion below the waterline. If you want a metallic look, you might want to finish with paint but are probably going to want to stick with gel coat anyway to obtain a perfect surface without additional surface preparation. If your part is made with carbon fiber, you may want the carbon to show through and we would recommend an entirely different product which is the #1045-B Duratec Sunshield Clear Topcoat. This product will give UV protection to your (probably) epoxy resin and give a hard, scratch resistant, and deep high gloss finish to your carbon fiber part. If your part is made with epoxy and you don’t want the reinforcement to show through, ChromaGlastTM Paints and undercoats are the way to go. ChromaGlastTM Paints and undercoats offer some definitive advantages for any type of composite repair. Before coming to this final cosmetic step, you will need to complete your repair of course. However, there are many challenges to gel coat repair that make ChromaGlastTM Paint a better option. Classic gel coat repair can be very difficult. Because gel coat is formulated to be used in a mold, it behaves very differently when it is applied to an exterior surface. First, gel coat requires an air inhibited cure, meaning that it doesn’t cure well (or even at all) when exposed to air. There are several products available to address this issue and gel coat repairs have been successfully completed for years, however, there have also been many failures. Second, trying to match a gel coat color is very difficult. If you are trying to only apply gel coat to your repair area, you are nearly always going to see the patch. You are likely to have the same problem with a small area of ChromaGlastTM Paint. However many people will want to recover the entire surface after a repair to restore optimal cosmetics and spraying gel coat over a large area on an exterior surface can be a real challenge. If you are repairing a boat below-the-waterline or anything that will be immersed, you will have to use gel coat instead of ChromaGlastTM Paint. But if you are simply covering a large area for cosmetics, ChromaGlastTM Paint offers a far better likelihood of success with excellent cosmetics. Fibre Glast and PPG partnered to create ChromaGlast Paint and undercoats for these types of applications where gel coat is not appropriate. At Fibre Glast, we want to help you build a better composite. Since there are a variety of different projects that can be tackled—building a new polyester mold, making a below-the-waterline repair, finishing a drone, or whatever your project may be—we want to offer the right material for your application. If you still have questions about which product is suitable for your specific need, feel free to call us at 800-838-8984.